Fall is the time when the greatest diversity of fungus (mushrooms) is usually seen, with the boldest colours and most interesting, eye-catching shapes. However, summer can be pretty good, too. We’re just starting to see quite a number of speciies appearing in the woods around our research sites, and I’ve been collecting photos for sharing here. There are quite a number of nondescript species in the woods, as well, but these are some of the more interesting ones I’ve come across recently. The first one is Yellow Nolanea, Nolanea murraii. We found these in the deciduous woods at Rock Ridge as we were hiking out one day. Their yellow colour caught my eye at first, but it was the intriguing peaked conical caps that grabbed my interest. 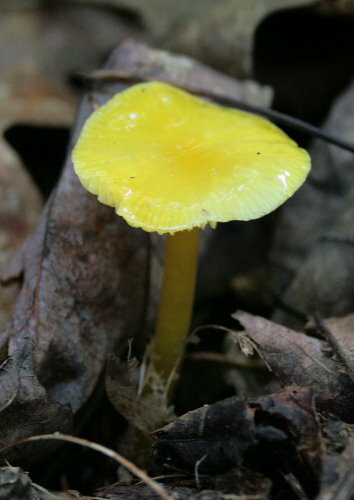 It’s a fairly common and widespread species, also sometimes called Yellow Unicorn Entoloma. 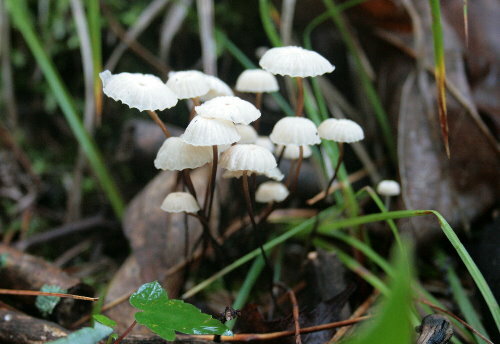 Entoloma is an alternative genus – I gather that taxonomy for this group of mushrooms is still being sorted out. Another yellow one, this is Yellow Waxcap, Hygrocybe flavescens… I think. 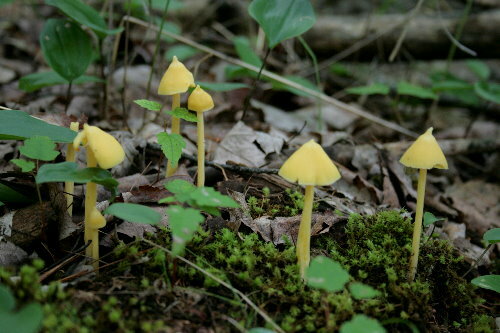 You’d be surprised at how many bright yellow, small, flat-capped, gilled mushrooms there are. One of the characteristic features of waxcaps are, unsurprisingly, their shiny, waxy caps, and this one certainly has a shiny cap. Gilled mushrooms such as this one are usually separated by the colour of the spore print they make. A spore print is when you take the cap of the mushroom off the stem and set it on a piece of paper for an hour or two. The spores fall out of the gills and onto the paper, leaving a print. Depending on the species, the print may be pinkish, brownish, or light or dark colours (usually variations on grayish). Yellow Waxcap is in the light-spored group, and has a whiteish spore print. Of course, I don’t really like to pluck the cap off mushrooms I find, particularly if there aren’t very many of them, so I’m content to call the species a “maybe” and leave it at that. I believe this is another member of the same genus, Conic Waxcap, Hygrocybe conica. 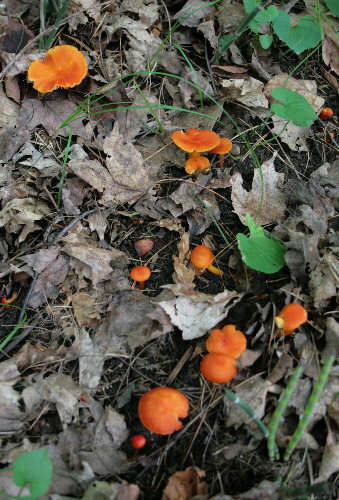 The yellowish stems and shiny orange caps seem to match (Conic starts out red, but fades to orange as it ages). The downside of taking photos and trying to ID from them later is that often you don’t know to check for certain features. For instance, Conic Waxcap, when you bruise it, turns black. I didn’t think to try bruising it, so I don’t know if this mushroom would turn black or not. This one was clearly a bolete. Boletes have solid undersides with many small pores from which they release their spores, rather than the gills of the first three mushrooms. Narrowing down the species of bolete is trickier. I think it’s Orange Bolete, Leccinum aurantiacum. The guide book specifies the spore print to be brownish, but again, I didn’t try doing that. It was the only one in the area that I noticed. The stalk is supposed to have red-brown or black dots, but the photo in the book doesn’t show dots, or at least nothing obvious. This dainty little species was growing in the path at Rock Ridge on our last visit, having popped up in the week and a half since we were previously there. There are a couple of genera that are characterized by small caps on delicate stalks. One is Mycena, and the other is Marasmius. This one is Marasmius delectans, I think (noticing a pattern with that word?). 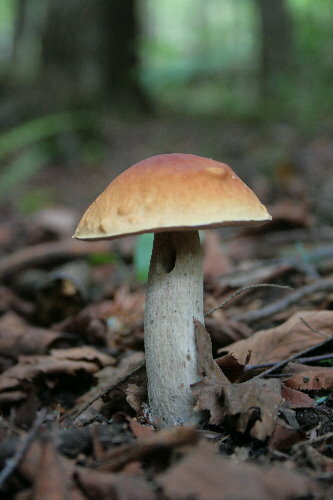 Most of the species have whiteish caps with darkish stalks. Many are told apart through variations in the shape and size of the cap, and can sometimes be subtle. 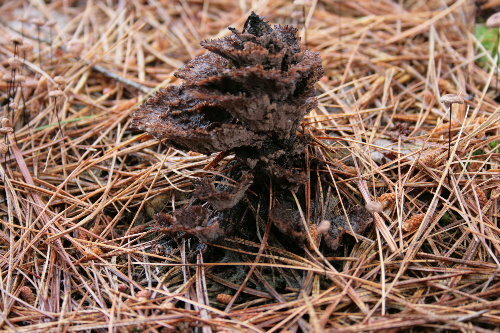 This frilly brown fungus, resembling a spruce tree a bit in its structure, caught my eye as I was checking out a family of Field Sparrows foraging under some pine trees at Rock Ridge. I think it’s a species of Thelephora, possibly Thelephora terrestris, Earth Fan. My book suggests it should have a whiteish margin, but there are some photos online that don’t show that. As I was editing the photo, I noticed that there were little Marasmius mushrooms growing alongside it that I’d completely missed when I was there in person, as caught up with the main fungus as I was. These ones seem to have a brownish centre to their cap and I think they may be M. androsaceus. And finally, this fungus I discovered when I stepped off the path to photograph a group of Indian Pipe at Maplewood Bog a couple weeks ago. Appropriately, fungi that grow in branching formations like this are called coral fungi. 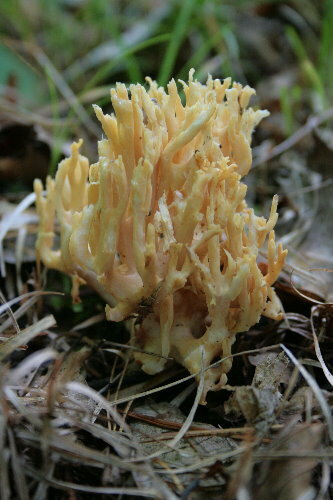 I suspect this one is Golden Coral, Ramaria aurea. One of the notes in the guide is that the species has a thick, short, whitish stalk, which this one has. The fungi shown above all release their spores from either gills or pores on their undersides, but coral fungi are covered with a layer of spore-producing cells that are essentially their skin. Wonderful pictures – thank for sharing them! I just discovered my first Indian Pipe recently. Amazing. V-e-r-y cool Seabrooke! I’m often stopped in my tracks by fungi when roaming around and, I’m ashamed to say, I have no idea what they are – even if edible. What a lazy bones! Beautiful. I love the bright colors against the dark forest floor and decomposing wood. I don’t know a lot about fungus, but I’m quickly getting the bug! Great photos and info on the Fungi…I pick and eat a few mushrooms that I know..always like to learn a few new ones. Another fine post. I too am working on my mushrooms. The Earth Fan comes as news to me. Great name, Earth Fan. What mushroom books do you favor? I find that the mycologists tend to write most wittily.